Today my friend Domenic Alonge and I went out to Changhua to take a look at some historical houses along Route 137, which runs south out of Changhua City along the base of Baguashan. Our goal was the Liu House in Shetou Township, which was first built in the 18th century and then gradually expanded over time until it reached a colossal 420 buildings. The complex is located at the intersection of Shanjiao Rd (137) and Xinya Rd. This is right on the Km 19 marker for Rte 137. Visible in the satellite photo above are several other large old housing complexes; I counted at least 8 along the way, some of which had been assimilated into modern local housing complexes, others which had defied the tide of modernity and not been integrated. 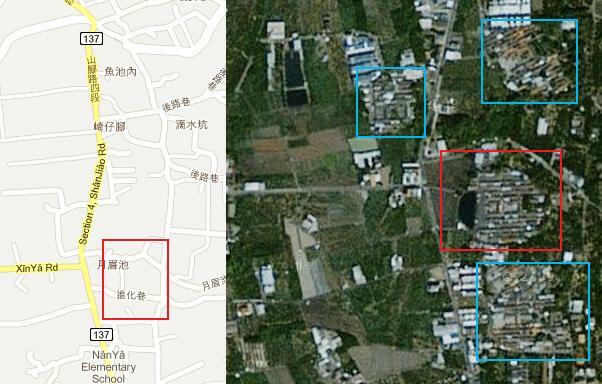 We also visited the large complex to the northwest, the blue square in the right-hand corner. Dom stops to put on his UV 50 sleeves. The sun was brutal today. Rte 137 is a two lane, rolling road that gradually leaves the built up areas around Changhua city as it heads south. It would be quite pleasant except for the trucks that populate it. There is a large stone marker on the road to the house. The local government has placed a few signs at the site to explain what you see. Yuemei Lake, in front of the complex. One of the innumerable rows of buildings. Me with the buildings behind. We didn't go deep into it; no one came out and it is an actual home to the family, after all. Two of these sit in what is now the parking lot. The sign said the thing was a platform for a flagpole for display of the official flag denoting scholar rank, I think. Corrections welcome! Such porcelain tile decorations are common on older local buildings. A delicate painting above a door. We also stopped at the complex of old buildings right next door, where Longans were drying on the ground. This one had some interesting tile work on it. Close up of a strange animal on the roof of the main building. I thought this other set of buildings was definitely more interesting than the Liu house. On the way back we took a rest at a local historical site, a former brick kiln, which is now a sort of park. There's not much there, but we cooled off by putting our heads under the tap. 137 is a nifty little road well worth exploring, especially if these old houses interest you. Michael, what was being dried on the ground in that one shot? Longans. Thanks for the reminder, I updated the post. Thanks for the info Michael, looks interesting! I'll have to drop by next time I'm cycling in Changhua. I don't think you can call 137 pleasant anywhere. It's an extremely narrow road normally dominated by bicyclists who ride in the middle of it and trucks. Now add 5-10 more feet to the width and you'd have a pleasant road. I find 139 much more enjoyable. I will look into those houses though. Very nice find. That's probably true, I tend to think of the southern end of the road, which I've spent more time on, Okami. Another problem is the endless construction.